There are two types of nailers required by finish carpenters, and those are brad nailers and finish nailers but also referred to as a nail gun. Carpenters and DIYers need this type of tool in their arsenal like a chef needs his knives. It’s used to drive nails into wood without needing a hammer. It’s driven by compared air (pneumatics), electromagnetism, and flammable gasses like butane, propane, or a small explosive charge. In our Finish Nailer buyer’s guide, we will do our best to help break down each top brand of Finish Nailer to help you find the one that is just right for your next projects. 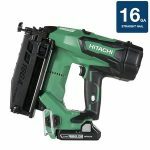 Here is the Hitachi NT65MA4 2-1/2 inch 15-Gauge Angled Finish Nailer with Air Duster that is an ideal nailer for installing both base and crown moldings, door and window casings, chair rails, cabinets, etc. It’s angled magazine, and compact body makes for easy operation and placement in tight angles. Users can enjoy the convenience of an integrated air duster that clears workspaces of debris. We like how this tool is meant for the everyday pros, beginners and DIYers can enjoy the finish nailer, too, but it’s extra special when a professional can sink their fingers in a beast of a tool to handle demanding jobs while being lightweight. 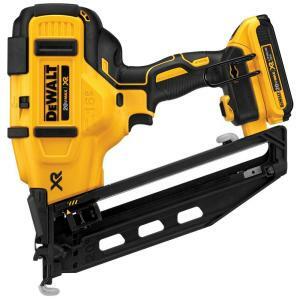 Q – Does the nailer come with a case? A – Nailer comes with a heavy duty case that has storage space for a couple of packages of nails. Q – What length of nails can it work with? A – Fires 1-1/4″ to 2-1/2″ 15g angled finish nails single and bump fire. Q – What psi does it run? A – Operating pressure is between 70 and 120 psi, based on the length of nail you are using, and the hardness of the wood that is going to be fastened. Q – Do we have to strictly use Hitachi’s nails or can we use different brands of nails? 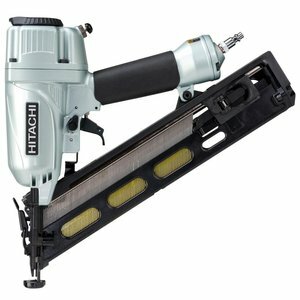 A – You can use any of the brands like Porter Cable, Bosch, and Hitachi without any problems surfacing as we feel Hitachi may just be covering themselves in case you use a low-quality nail that ruins the nailer you void any warranty. 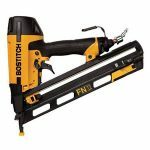 Here is the BOSTITCH N62FNK-2 15-Gauge 1 1/4-Inch to 2-1/2-Inch Angled Finish Nailer that comes in lightweight magnesium housing weighing 3.8 pounds reducing user fatigue and increasing productivity. Its engine is oil-free needing no lubrication and will not stain any surfaces. The highest power-to-weight ratio with its 400-inch-pounds of incredible driving power. We like the removable magazine on this tool as its tool-less making it much easier to clean and clear up any jams while using. We also dig the quick countersinking adjustments for depth control plus the tool-free adjustable exhaust that will direct the airflow – this beast of a tool is low maintenance and we like it! Q – What is the angle of the nailer? Q – Can this nailer gun be used to build wood fences from 6′ to 8′ Cedar? A – It is a finish nailer. You’re going to want a framing nailer, and use ring shank galvanized nails. A – Yes. It has a plastic case that works pretty well! Q – Do I need an air compressor? A – Absolutely! It’s a pneumatic tool, as it needs an air compressor to power the air-powered nail gun. 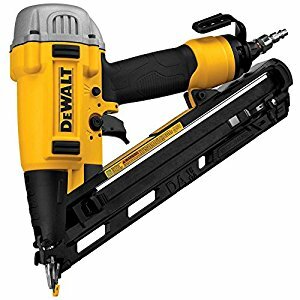 Here is the DEWALT D51276K 1-Inch to 2-1/2-Inch 15-Gauge Angled Finish Nailer that includes a tool-free depth adjustment, tool-free 360-degree exhaust, and a tool-free jam clear for an excellent low-maintenance tool that demands authority on the job site. We enjoy the 3.85 lbs of lightweight goodness this tool holds leaving us with less fatigue which increases our work performance and productivity. Lightweight at only 3.85 lbs. Q – Could I nail in different angles? A – Yes, as long as you adjust the depth adjustment on the gun to compensate if the nose of the nailer gun isn’t against the wood. Q – I’m having trouble finding 1 to 1-1/2 inch pneumatic nails, finding only 2″ where can these sizes be bought? A – Harbor freight or Senco carries those sizes. A – Yes! A Hard blow mold case with plenty of room for oil, nails, and goggles. 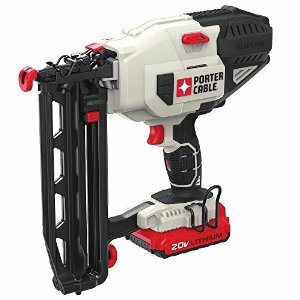 Here is the PORTER-CABLE DA250C 1-Inch to 2-1/2-Inch 15-Gauge Angled Finish Nailer that has a compact body created for easier placement and positioning. It also has an internal piston catch mechanism that keeps the piston at its initial position for all around consistent power and non-marring nose tip with onboard storage preventing unsightly marks from nailing. We love how effortless it is to install crown and base molding with this handheld soldier. No feature allowing to toggle between modes on the gun without changing triggers. Q – What other types of nails can I use with this finish nailer aside from the Porter-Cable? A – You must use 15 gauge angle nails. Q – Does it come with a sequential trigger? A – Yes it has one. Q – Is this a 34-degree finish nailer? Q – Does it come with a hard case? A – No, but it does include a carrying bag. Q – What are the minimum and maximum fasteners? A – Minimum of 1″ and a maximum of 2-1/2″. 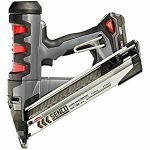 Here is the Senco 4G0001N FinishPro 42XP 15-Gauge 1-1/4-Inch to 2-1/2-Inch Finish Nailer that’s designed for tackling some of the most difficult nailing jobs with an operating pressure of 70 to 120 maximum psi that is built to perform. It can drive both the galvanized and bright 15-gauge nails from 1-1/4 to 2-1/2″ inches in the hardest woods. It is ideal for exterior and interior trim work such as base and crown molding, window, and door casings, cabinets, etc. We love the magnesium housing that goes through a war with excessive wear and tear without showing signs of being abused. Q – Can you get up into tight corners with this nailing gun? A – Yes if you usually use an 18 or 16 gauge finish nailer gun you will be able to get into tighter corners with this 15 gauge. If you are already using a 15 gauge gun, you will probably not see any difference with the same code in that respect. Q – Is there a belt hook on the tool? A – Yes! It’s included in the case. Q – Does the trigger need to be changed to go from sequential to “bump” firing? Here is the DEWALT DCN660D1 20V MAX 2.0 Ah Cordless Lithium-Ion 16 Gauge 2-1/2 in. 20 Degree Angled Finish Nailer Kit that is perfect for fastening trim, baseboard, crown and base moldings, door and window casing. The cordless finish nailer gets the job done with no noise and hassle. The Multi-functional lights deliver both workspace illumination and tool diagnostics, and we like the Tool-free depth adjustment for precise countersinking of nails. Q – Does the finish nailer come with a case? A – Yes and it’s a hard case, too! Q – Does it come with a battery and charger? A – Yes to both. Q – Can the tool set nails in hardwood? A – Yes with the setting adjustment. Q – Is it brushless? Here is the Hitachi 18V Brushless 16 gauge straight finish nailer – NT1865DM cordless and with no need for compressors, hoses, gas cartridges, and more equipped with a brushless technology. The cordless nailer provides enhanced power while being lightweight with longer runtime per charge. We like that it includes a tool-less depth of drive adjustment and a convenient on-tool battery life indicator. Drives around 1500 nails per charge with accurate, and flush results. Side-lock switch for added security measures to prevent accidental firing. Q – How much does the tool weigh? Q – Is this a bare tool or do batteries come with? A – The battery is included. Q – Can the pivoting belt hook be on either side to accommodate left-handed users? A – Yes! It can be mounted on either side for both right-handed and left-handed users. 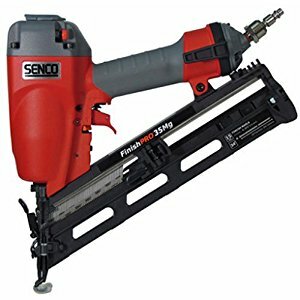 Here is the Senco 5N0001N Fusion Finish Nailer loaded with power and the utility of a pneumatic tool but with a more convenience cordless feature. We like their patented reflex-shot design that gives a quick shot when the pulling the trigger with no ramp-up time. Q – What’s the longest nail it can shoot and use? A – Shoots 1 1/4″ – 2 1/2″ 15 gauge nails. 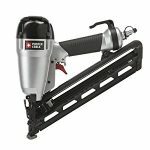 Q – How much does the cordless finish nailer weigh? Q – Does it include a carrying case? A – No case but a large bag with velcro straps – it’s real nice. Here is the Porter-cable PCC792LA 20V Max Cordless 16-Gauge Straight Finish Nailer that is battery-driven demolishing the annoying need for a hose, compressor, or even gas cartridges that are expensive. Users will get a consistent firing power for different materials such as crown moldings, cabinets, baseboards, etc. We liked the LED lights that are dual multi-functional for both error indication and workspace illumination. Q – Will this tool work for installing pine flooring which is a more softer wood? A – Yes, just check out the depth settings and set the impact for thickness and hardness of wood. Q – Can I use 18ga nails on this too or just 16ga? A – Only 16ga as you don’t want to damage the striker or get a jam. Q – Is there a carrying bag or case? 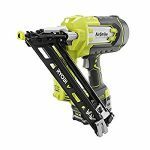 Here is the RYOBI P330 15-GAUGE Finish Nailer that introduces the fourth addition to the AirStrike line-up technology that squashes the annoying need for endless attachments such as bulky hoses, expensive gas cartridges, and loud compressors. Now you get a faster setup and can maneuver around easier with the cordless finish nailer. We like how this tool is a part of a collection that allows you the convenience to build on the ONE+ collection without spending more money for chargers and batteries for additional tools. Q – Can this angle nailer shoot a 16-gauge angle nail from Paslode? A – No it will cause jams. Q – Can it be used for framing. Q – How many degrees are the nails? When you need to drive many nails fast, the ideal solution is that of a finish nailer, and they sink thousands of nails accurately and consistently. There are a variety of finish nailers to choose from, and one may have features that would work best with a particular task which is why more goes into purchasing reason why we’ve got a finish nailers buyer’s guide here for you. Nailers are available in both a coil and a strip configurations. Coil-style nailers: Coil-style nailers will use a long, flexible string of nails joined with wires. Then there is a round magazine on the tool holds the nails in a coil. These nailers can fit into tinier spaces that will not accept many strip-style models. Coil-style nailers contain more nails than a strip-style model, which also means you won’t have to reload as much as other tools. Strip-style: Strip-style nailers will use nails arranged on a long, thin strip or stick that slides into an oblong magazine on the device. Pieces of paper, plastic or wire will tighten and keep the nails together. The strip-style configuration gives out the weight of the nails instead of concentrating it in a roll, as this will be giving the tool better balance than a coil-style nailer. Framing nailers: Will handle many tough projects such as building decks, constructing room additions or framing houses. Flooring nailers: Will speed up the installation of hardwood flooring. Palm nailers are small, pneumatic tools that can drive separate nails in small spaces. Finishing Nailers: Are much lighter than the framing nailers are and work perfectly for putting furniture and installing cabinets, trim and molding together. Staplers, Brad Nailers, and Tackers: Lightweight and are ideal for precision work. Roofing Nailers: Are for applying roof shingles. When you need a tool with high portability or a tool that can work for longer periods of time then the power source for the finish nailer needs to be considered. Fuel-Driven Cordless Nailer: Uses combustion to drive nails. Fuel drains out of the disposable gas cartridge and into the burning chamber. Battery delivers an electric charge to start the fuel, and the resulting explosive force will drive the nail. No annoying cords or bulky hoses are needed, giving this type of nailer good mobility and lower maintenance. Battery-powered cordless nailer: Delivers much greater portability than a pneumatic nailer since it doesn’t need a compressor or a bulky hose. Plus the battery-powered cordless model has a fast start-up time, but it won’t have the power of a pneumatic nailer which is a bummer.